It’s been a while again, hasn’t it? The truth is, this book took me a lot longer to read than I had anticipated, and I think reviewing it is going to be even more difficult. The Amazing Adventures of Kavalier & Clay is set during the Second World War. Josef Kavalier, a budding magician and comic book artist, escapes from Prague to New York, to live with his cousin, Sam Clay. Together, they create a costumed hero, the Escapist, who swears to fight injustice and take the fight to the Nazis. But really, all Joe wants is to get the rest of his family to safety. With a plot like that, how could I resist? Kavalier & Clay is exceptional in terms of the sheer amount of historical detail it packs in. It touches on everything, from the legend of the Golem of Prague, through to the golden age of comics, Dr Wertham’s condemning book, and attitudes towards sexuality in the 1940’s. It’s all impeccably researched, and it all serves the plot well. And, for the first two thirds or so, it’s truly gripping. Reading about Joe and Sam’s meteoric rise, as the Escapist gives way to bigger and bolder heroes like Luna Moth, and about Joe’s personal vendetta against New York’s small cadre of Nazi sympathisers, alongside his frantic efforts to get his family out of Prague was all great. Aside from a couple of small complaints here and there, I loved it. Then, along came the third act. I won’t spoil it, because I’m not in the business of spoilers, but there is a fairly considerable leap in time, and the story lost focus for me towards the end. As noted at the top, I took two weeks to finish Kavalier & Clay, and most of it was just getting through that last bit. Shocking changes in status quo happened ‘off panel’, and there was one in particular where I thought Chabon totally dropped the ball. I was told rather than shown, and that may have been his intent, but I was left rather underwhelmed instead of shocked. I’m not really sure if I’m missing something. Several people have told me this is their favourite book of all time, and I believe it’s been described as the greatest American novel of the past however many years, but I’m just not seeing it. Maybe my expectations were too high going in, I don’t know. Maybe it would have worked better as a graphic novel for me, where the pages of the Escapist could have really come alive, like the Black Freighter portions of Watchmen, a story within a story. I feel so conflicted in not thinking so highly of it, when everything tells me that I should have. But don’t let me dissuade you. Anyone who’s interested in comics history or World War II should definitely give it a look. It just didn’t quite hold together for me right through to the end. Maybe it will on a repeat reading in a few years. 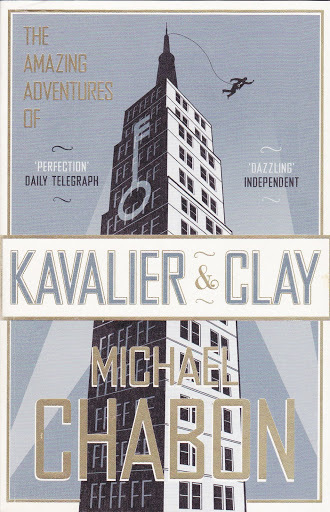 This entry was posted in Book Reviews and tagged Books, comics, fifty books, Kavalier & Clay, Michael Chabon, review, The Amazing Adventures of Kavalier & Clay, world war 2 by Chris. Bookmark the permalink. I also was not as enamoured with this book as the critics although I did enjoy it. I actually prefer another of Chabon’s books, The Yiddish Policemen’s Union, over Kavalier and Clay.